George Graham Reviews Ruth Moody's "The Garden"
Folk groups that specialize in harmonies are a long-running tradition. Some get together for the purpose, and while others are groupings of independent artists who collaborate while maintaining their individual careers. From the historical record one has Peter, Paul and Mary representing the former, and Crosby, Stills, Nash and Young the pattern for the group comprising artists with individual careers. This week we have a solo recording from a member of one of the today's notable folk harmony groups, the Wailin' Jennys. It's Ruth Moody, and her CD is called The Garden. The Wailin' Jennys are from the Canadian prairies, where three singer-songwriters were invited to perform together at a guitar shop in Winnipeg in 2002. Ruth Moody, along with Nicky Mehta and Cara Luft's first gig went well enough that they decided to continue their collaboration. Ms. Luft was subsequently replaced by Heather Masse from New York. But each has maintained their solo careers. Ms. Masse released a CD earlier this year, and now Ruth Moody is out with hers, a delightful recording that highlights her worthy songwriting and features an eclectic, mostly acoustic supporting cast with some classy musicianship. Ms. Moody was actually born in Australia, and grew up in a musical family. Her mother is a music teacher, and each of her three siblings is also a musician. Her brother Richard plays violin in a group called the Bills, sister Rachel plays violin with the Winnipeg Symphony, and sister Jane plays cello, but also has a career as a psychiatrist. Ruth took up piano, being the only one in the family not on a string instrument. She studied classical voice and also took a great interest in folk and traditional music, including Celtic. Torn between studying to be an English teacher in college and performing folk music, the latter won out, and in 1997 she began performing with a Celtic-influenced group called Scruj MacDuhk. She served as their lead vocalist for some five years. After the band broke up in 2001, Ms. Moody took up the guitar and did more concentration on her songwriting, and the following year, began her collaboration in the Winnipeg trio of singer-songwriters that would become the Wailin' Jennys. While she released a solo EP in 2002, she has been concentrating her songwriting efforts on behalf of the Jennys. But now she is out with her solo recording, The Garden, which is a bit less harmony-driven, but instead relies on subtle instrumental colors to provide the musical setting. It also puts Ms. Moody's beautiful airy soprano voice out front. The Garden was produced by David Travers-Smith, who has worked with another talented Canadian singer-songwriter, Jane Siberry, as well as with the Wailin' Jennys projects. The other two Jennys do appear on one track, but otherwise, there is a fairly large supporting cast, including all the members of the eclectic acoustic group Crooked Still, and Ruth's brother Richard Moody on violin, among others. Ms. Moody plays several instruments, including guitar, banjo, and piano. Producer Travers-Smith also plays a motley collection of instruments from keyboards to trumpet. The sound ranges from traditional-folk in influence to rather atmospheric, with a bit of roots groove thrown in from time to time. Ms. Moody writes mainly love songs, many of them rather sad about parting or losing one's significant other. 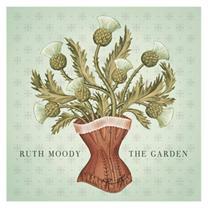 Ruth Moody's new CD The Garden, is thoroughly enjoyable recording of mostly acoustic music by a fine singer-songwriter with an angelic voice, stepping out on her own in a side project after her years as the soprano vocal and one of the principal songwriters in the Wailin' Jennies. Although contemporary folk is the main direction of the CD, there are some nice combinations of musical influences, with some wonderfully tasteful arrangements, and very nice subtle playing by the various guests -- there are 27 supporting musicians listed in the credits on the various tracks. Our rating for sound quality is a rare unqualified grade "A." Ms. Moody's vocal is beautifully recorded, and the acoustic instruments are also very well-captured with an open, airy sound. Even when there is the added spacey reverb sound, it's well-handled. And the overall recording has an extremely rare quality these days: a decent dynamic range -- the recording is actually allowed to get soft when the music calls for it. The Wailin' Jennys are one of today's best folk harmony groups, but Ruth Moody's new solo album shows that she's just as appealing in her own musical context.